If you noticed, urban style quickly takes a leading place in web designs. These dirty, abstract and aged elements have become new favourites for many designers. If you still adhere to glossy and shiny designs in the style of the web then it’s time to move to a new style – urban style. 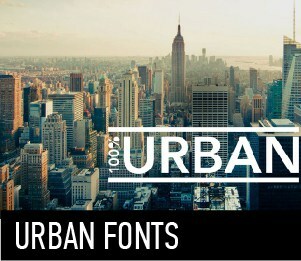 Urban style in font design is a balanced combination of simple and concise forms. Preference is given to geometry in the construction of letters is not allowed florid, smooth, curved. That is, monograms, scrollwork, and other decorations is unthinkable, you will not find them. Very often in urban fonts elements of grunge are used, and in some cases graffiti are used as well.. After all, graffiti is an integral part of a huge metropolis.